Why do we Age? Describes current theories about the nature of human aging including modern programmed aging theories, simple damage theories, fundamental limitation theories, and modern non-programmed theories. 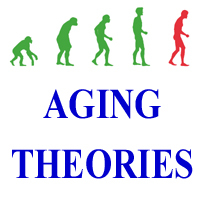 Discusses the relationship between evolution theory and aging theories and mechanisms. Medical Implications of Aging Theories Discusses how different aging theories lead to drastically different conclusions about the nature of human aging and age-related diseases. Anti-Aging Medicine Summarizes the current (2018) practice of anti-aging medicine and the American Academy of Anti-Aging Medicine. Discusses potential anti-aging treatments and agents. These articles discuss how attitudes about aging are affected by training and other factors. Attitudes affect funding for research.